Hopefully you’ve been keeping up a program of exercise and stretching through the winter. If so, you’re ready to start boating come spring. If your winter exercise program has consisted largely of reaching into the chip bag and operating the remote control, jumping right into high intensity-boating is asking for what can be debilitating injury. Battling big waves, Lochsa River, Idaho. Acute and chronic boating injuries caused by lack of conditioning or over-straining muscles are primarily in the upper body. Paddling and rowing are repetitive motions that can lead to inflammation of joints and muscles. Boating in turbulent waters can result in sudden, violent extensions of joints and muscles, causing dislocations and tears in tendons and muscles. Wrists, shoulders and backs are the most common areas of the body where boaters suffer injury. So, how do you avoid injury to these areas? It takes a combination of approaches—conditioning, warming-up and stretching, using correct technique and the right equipment. You can sign-up at a gym or do it at home. Most gyms have trainers that can help you design a program. There are also some excellent books and Internet resources. The important thing is to “just do it” on a regular basis. Adopt a balanced program of exercises that strengthen the muscles in the chest, arms, shoulders, upper and lower back and abdomen. Paddling and rowing are excellent conditioning exercises themselves. When first beginning in the season, start easy; work your way up to longer sessions. Before exercising and paddling, warm-up the muscle groups you’ll be using. Do this by making the same motions you’ll be using on the water. Rotate your shoulders forward and back, twist and lean your torso, move your body forward and back, etc. Repeat the motions until you feel the muscles loosen up. Stretching out muscles and tendons improves flexibility and elasticity, helping to prevent injury. Select a range of stretches that cover all the body areas you use. Stretch easy, you should feel a good tension but never any pain. Hold each stretch for 15-20 seconds. Stretch during any breaks during a day’s paddling and at the end of the day. Tyler dialing in his stroke. Kayakers are especially vulnerable to shoulder problems. Avoid a high brace, where the outer arm is elevated. Keep the upper arm as close to your body as possible. Also, use a relaxed grip on your paddle shaft, “white knuckling” the grip puts undue stress on your forearm and wrist. When rowing, if the oar gets caught on a rock, release it before it jerks your arm out. All the conditioning in the world won’t save you if you abuse your body by asking it to do something it’s not designed to do. Paddling and rowing require repetitive motions, motions that can be repeated hundreds of times during a day. 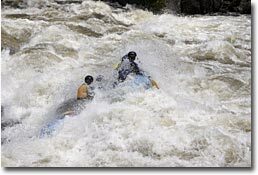 Kayakers sometimes experience pain as a result. Many find that a bent shaft paddle, which puts their hands and wrists in a more neutral position, cures this problem. Additionally, going to a lighter paddle and/or one with a reduced feather can bring relief to the muscles and joints in your hand, wrist and arm. When you’re rowing, usually at least two-thirds of the oar is outside the oar mount. Lifting that weight every time you take a stroke can wear you out and lead to injury. You may find you can use shorter oars. If a buddy has some, give that a try. You can also go to a lighter oar, add counterweights to the handle end or purchase oars with counterweights in the handles. The bottom line? Take care of your body and your body will take care of you. The “12-ounce forearm curl” isn’t sufficient exercise to prepare you for boating. Stay in shape, use the right technique and equipment, and you’ll still be boating when you’re old and gray. Our wish is to “see you on the water,” healthy and safe, for a long time!